Welcome to another la-la land club kit post. 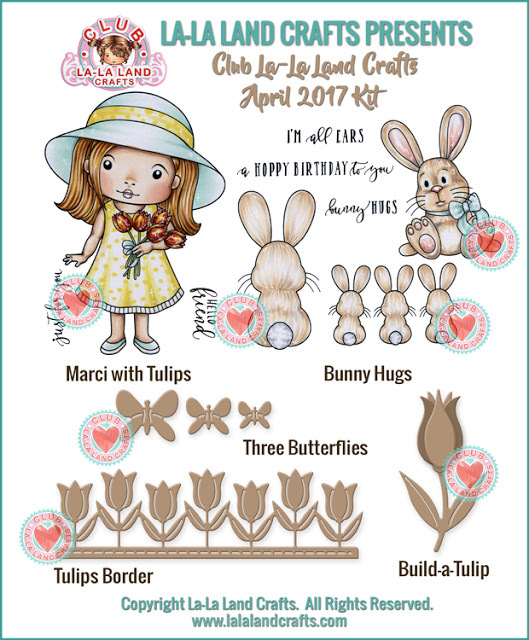 Today I'm showing you my projects made with April's club kit. This kit is all about SPRING. You can get your club kit too if you subscribe to la-la land club HERE! I love the butterflies on this card. I cut them three times, once from design paper, once from vellum and once from Adhesive Vinyl. I layered them and glued together. I only kept the middle part on the vinyl butterflies. I love how they turned out. My soecond card was made again with the Bunny Hugs set. Again I added the cute butterflies and on this card I also used Build-a-tulip dies. 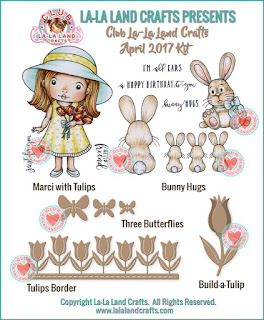 The third card features Marci with tulips and all the dies from the kit. Čudovite so vse tri! Všeč mi je kako si naredila vzorček na klobučku!